Sweden-based company Eolus is reviving plans to build the Crescent Peak Wind project in southern Nevada on wildlands prized for wildlife and primitive recreation. 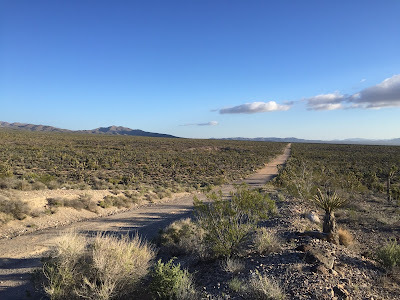 Basin & Range Watch learned that the company filed initial paperwork with the Bureau of Land Management (BLM) to begin environmental review of the project. 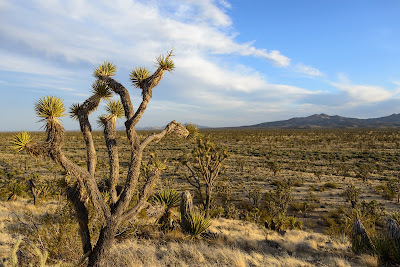 This photo was taken along the northeastern boundary of the Wee Thump Joshua Tree Wilderness Area. The Crescent Peak area is in the distance on the right, and would be covered in giant wind turbines if Eolus gets its way. Eolus is targeting a patchwork of unprotected lands in the Piute Valley that the BLM acknowledges are ideal for primitive recreation, and surrounded by conservation and wilderness designations. The Piute Valley offers a “range of outdoor recreation activities associated with a wide-open landscape with limited developments,” according to the BLM's own draft resource management plan. The Piute Valley is roughly an hour drive south from the Las Vegas metropolitan area, offering an outdoor getaway to a population increasingly hemmed in by sprawl and industry. 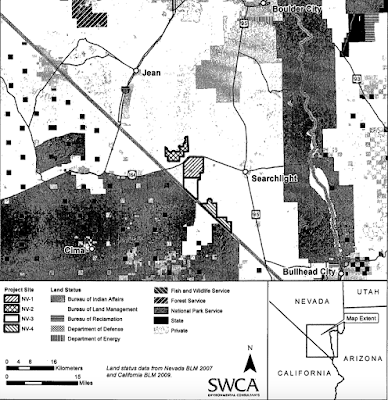 Wildlands to the northeast of Las Vegas are being bulldozed for utility-scale solar and industrial parks (Dry Lake Solar Energy Zone, Moapa Solar project, Apex Industrial Park), suffering the same fate as the Ivanpah Valley to the southwest of the city. If the project is built, however, dozens of giant wind turbines towering hundreds of feet in the air would span across the ridgelines, with red hazard lights flashing at night. 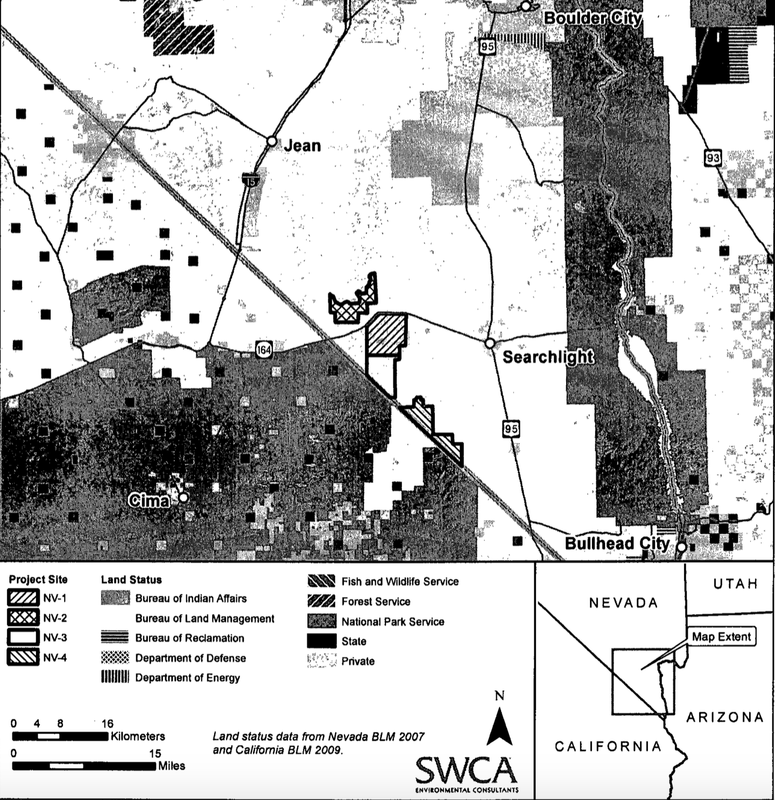 The industrial project would tarnish the wilderness qualities of the neighboring Wee Thump Joshua Tree Wilderness, South McCullough Wilderness, Mojave National Preserve and Castle Mountains National Monument. Looking north along the Walking Box Ranch Road, a gateway to the Castle Mountains National Monument. Crescent Peak is in the distance on the left, forming the gentle northern edge of the New York Mountain range that spans the California and Nevada border. The western Piute Valley and McCullough Mountain area also appears to host a high density of golden eagle nests. A Nevada Department of Wildlife survey found nearly 40 golden eagle nests within and near the proposed footprint of the wind project. The Desert Renewable Energy Conservation Plan identified several golden eagle nests on the California side of the border in the New York Mountains and Castle Mountains (Appendix R2.7 of the Draft DRECP). The Eolus project would have to conduct extensive golden eagle surveys to determine an estimated impact on the species, but some project developers decide to move forward with projects despite high risks to golden eagles and other avian species. Stay tuned for updates on this project proposal and its estimated impacts on wildlands and wildlife. Above: An approximate outline of the proposed Crescent Peak wind project in red, imposed on a Google Earth image of southern Nevada and eastern California. Below: A map submitted in 2012 by the project's first proponent - Oak Creek Energy Systems. A quintessential rite of passage for Mojave explorers will no longer offer the same journey into unconfined and wild desert that generations of travelers have shared if a Sweden-based company gets its way. A document released by the Bureau of Land Management (BLM) under a Freedom of Information Act request indicates that towering wind turbines of the proposed Crescent Peak Wind project would be visible from a majority of the Mojave Road in the eastern Mojave desert. 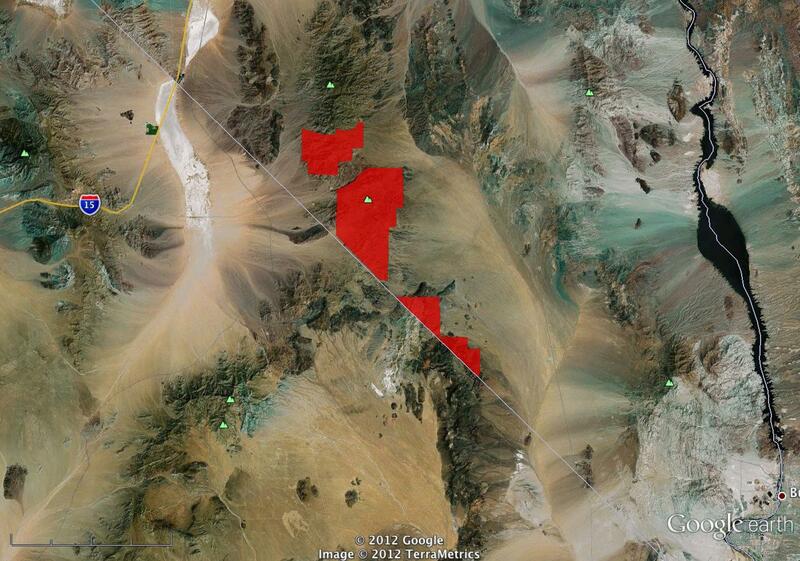 Should Orange County Get Mojave Groundwater? UPDATE - August 26th, 2018: California State Senator Richard Roth just introducted SB120, a companion bill to AB1000, that would have the same effect: ensure proper environmental review of the Cadiz groundwater pumping scheme. Please call California State Senate leader Toni Atkins' office and ask her to make SB120 a priority. You can reach her office at (916) 651-4039. Nevadans are poised to lose access to hundreds of square miles of desert and mountain wildlands over the next few years, and elected officials appear to be looking the other way. The crush of proposals to convert desert and mountain wildlands into sprawling solar and wind facilities, natural gas drilling fields, expanded military bases, and urban sprawl has left outdoor enthusiasts' efforts divided as they chase each individual threat. When desert communities in neighboring California faced a similar onslaught, the chorus of concern prompted policy changes at the local, State and Federal level to better guide development and protect desert wildlands and rural areas. No such rescue effort appears on the horizon in Nevada.